Q:How to create 3D effect when convert PPT to flipbook? When you convert PowerPoint to flash book, you can create 3D effect for your eBook as well. 3D effect can enhance your book charm and make your book more real book like. It can bring people more special reading experience than just a plane page. With a 3D PPT eBook, you can rotate the book with your. Mouse pulley or adjust your book tilt angle. Now let see how to do it. Step1: Run 3D PageFlip for PowerPoint, on the left layout setting panel to set tilt angle for your 3D page turning book. 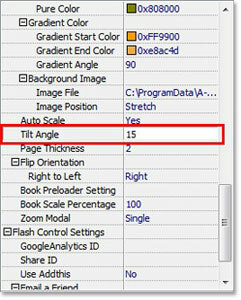 Step2: Adjust the number of “Tilt Angle” to get different point of view for your flash book. Then click “Apply Change” to make it work. If you want to rotate the book frequently, you can move your mouse above the book and rotate it by Mouse pulley. 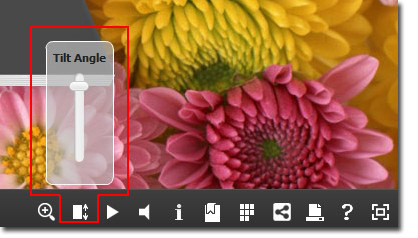 Or you can use the “Tile angle” button in the flipbook tool bar to adjust the book angle to view 3D page flip effect.